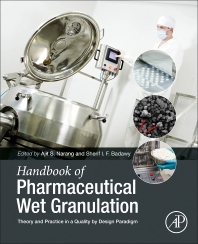 Handbook of Pharmaceutical Wet Granulation: Theory and Practice in a Quality by Design Paradigm offers a single and comprehensive reference dedicated to all aspects of pharmaceutical wet granulation, taking a holistic approach by combining introductory principles with practical solutions. Chapters are written by international experts across industry, academic and regulatory settings, and cover a wide spectrum of relevant and contemporary wet granulation topics, techniques and processes. The books' focus on process analytical technology, quality by design principles, granulation equipment, modeling, scale-up, control and real time release makes it a timely and valuable resource for all those involved in pharmaceutical wet granulation. Ajit S. Narang works for the Bristol-Myers Squibb, Co. in New Brunswick, New Jersey, in the biopharmaceutical aspects of drug delivery. He has more than eight years of experience in the pharmaceutical industry in the development of oral dosage forms and drug delivery platforms. In addition to the Bristol-Myers Squibb, Co., he has worked for Ranbaxy Research Labs (currently a subsidiary of Daiichi Sankyo, Japan) in Gurgaon, India, and Morton Grove Pharmaceuticals (currently a subsidiary of Wockhardt USA LLC, Parsippany, New Jersey) in Vernon Hills, Illinois. He has more than 35 publications and three pending patent applications, and has contributed to the development of several marketed drug products. Sherif Badawy, Ph.D., is a Research Fellow in the Drug product Science and Technology of the Bristol-Myers Squibb Company. He received his B.S. in Pharmacy and M.S. in Pharmaceutics from Cairo University, and his Ph.D. in Pharmaceutics from Duquesne University. He has more than 20 years of industrial experience in drug product development. His current responsibilities at Bristol-Myers Squibb include formulation and process development and scale-up of commercial oral solid and liquid dosage forms. His areas of research interest include high shear wet granulation, tablet compaction, stability of solid dosage forms and bioavailability enhancement of poorly water-soluble compounds. He authored more than 40 manuscripts and numerous abstracts and presentations in those areas.